Island Grill Restaurant in Fort Collins, Colorado | Best Fish Tacos! Sunday Breakfast - Join us at the Island Grill every Sunday for breakfast from 10am to 4pm. Our delicious breakfast menu caters to all taste buds, and it won’t dent your wallet either! Try our Two Eggs and Meat plate, Waffles, Biscuits and Gravy, Country Fried Steak platter and our Breakfast Burrito.. Happy Hour drink specials all day, and $3 Mimosas, Bloody Marys and 10oz beers! Avalanche/Nuggets Night - Starting November 7th, get to the Grill every Tuesday for the Avalanche and Nuggets games. We'll have either or both games (if they are playing) on our 22 HD TVs, 120" & 96" HD projection TVs. Also every Tuesday, enjoy Odell draft beers at our happy hour prices from 3pm -10pm. Burger & Brew - Get to the Grill every Wednesday for a burger and a brew. Enjoy any burger, up to 3 toppings, with a side or any specialty burger with a side and get a free draft beer, well drink, soda or tea. Happy Hour Fallback Specials - We have new Happy Hour specials going on! Join us everyday from 3:00pm-7:00pm for our Fallback drink specials. These specials include: $3.25 Domestic Pints, $3.00 Shot Specials, $3.50 Well Drinks, $4.25 Micro Beer Pints, $4.00 House Wines, $5 Margaritas, and $6 House Martinis. So come Chill at the Grill everyday! 75 cent Happy Hour Wings Are Here!!! - Aloha Islanders! We have 75 cent wings for Happy Hour everyday from 3pm-7pm and all day Sunday! Get as many as you like and mix and match from our delicious sauces (Buffalo, BBQ, Sesame, Thai, Buffalo-Sesame, Honey Habanero, and Sriracha Honey) or try one of our dry rubs (Blackened, Jerked, or Curry)! Enjoy some refreshing Happy Hour drinks as well. Also, come watch the Rockies on our 120" HD TV. So come chill at the Grill! 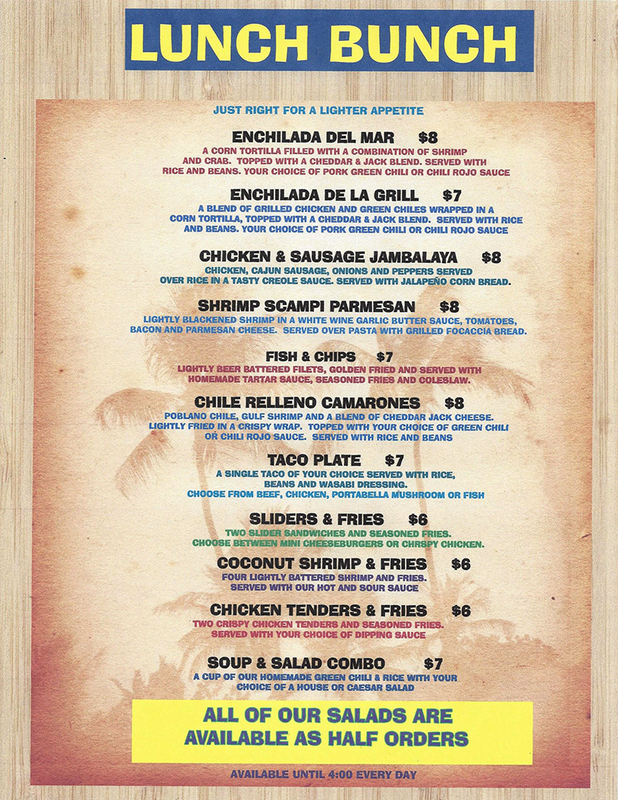 New Lunch Menu - Join us everday for lunch at the Island Grill. Look over this new lunch menu for all our new lunch items. Try our Enchelada del Mar, the Chicken and Sausage Jambalaya, or our Sliders & Fries. We also provide all of our salads as half orders too. It just right for a lighter appetite! Island Grill Catering - Need a large space to throw a party? Call The Island Grill. That’s right we're not just a restaurant with delicious food and a favorite local hangout in Fort Collins, we also cater to all your big party needs. We have plenty of room to accommodate your group and we’ll put out a delicious spread that will make everyone’s mouth water. Whether your having a party, meeting, casual get together, reunion, or a wedding, the Island Grill will cater your off-sight event as well. We're also one of the exclusive caterers for Island Promotions LLC. Check out our catering menu or call us at 970-266-0124 to create your party!